For the second year in a row, McGill was privileged to host the Royal Canadian Legion, Quebec Command’s official Remembrance Day ceremony. The hundreds of people gathered on campus craned their necks upward, their collective silence having been interrupted by two Griffon helicopters which flew directly overhead shortly after the cannon’s third thunderous boom from the cannons stationed in front of the Arts Building shook the ground. 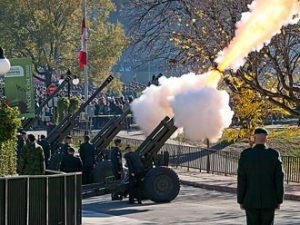 The first cannon shot had been fired moments after McGill’s new clock tower bells tolled eleven times on a brisk Nov. 11 morning. It would be fired once more every minute before reaching the number a proper military salute demands, twenty-one. For the second year running, McGill was privileged to host the Royal Canadian Legion, Quebec Command’s official Remembrance Day ceremony – a privilege that included an opportunity to see an impressive parade of uniformed officials march on to the field and take their positions before an inspection by guest of honour Pierre Duchesne, Lieutenant Governor of Quebec. It included the Black Watch (Royal Highland Regiment) of Canada with pipes and drums in tow, The Canadian Force’s 34th Brigade, students of the Royal Military College (St. Jean), and representatives of the RCMP and Montreal police. Beyond their crisp uniforms, Les Fusiliers Mont-Royal were also outfitted with the instruments they would use to play O Canada among other numbers. Dozens of school children also partook in the parade and positioned themselves on the field along with the many veterans present. It is the members of this younger generation that have the most to gain from ceremonies such as this one, in that they might come to understand how the sacrifices of others are the foundation for many of the freedoms we now enjoy; how remembering war is really about embracing peace. The priest reciting one of the prayers, for instance, explained that “those who gave up their tomorrow so that we may have today” did so that peace may envelop the world – not simply peace as an interlude to war, he emphasized, but a lasting, eternal peace among us all.